In business since 2008, Bone Dry Roofing's Columbus office is dedicated to providing quality roofing, gutter, and masonry services delivered with exceptional customer care. We are a family owned company that takes a personal interest in each customer, and that sets us apart from the rest. And as an Owens Corning Roofing Platinum Preferred Contractor, we have access to top-quality products with extensive warranties that not all contractors can offer. Our office is one of ten Bone Dry offices throughout the Midwest. Bone Dry Roofing opened in 1989 in Indianapolis, and since then we have become one of the largest roofing companies in the region and in the county. We are very proud to contribute to this legacy and perform essential roofing services in a manner we believe in! Andy Gastineau, General Manager, is in charge of day-to-day operations at Bone Dry Roofing. Andy Gastineau has been working in the construction industry for over 20 years, and he's been with Bone Dry Roofing since 2013. 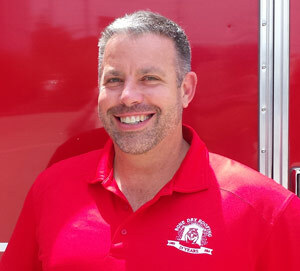 Andy's responsibilities include managing and overseeing all aspects of Production and Sales for the Columbus office. He loves the fact that even though Bone Dry Roofing is one of the top roofing companies in the country, we still have the feel of the family-owned business we are! Bone Dry Roofing's Columbus office is lucky to have an experienced leader like Andy at the helm. Outside of work, Andy enjoys spending time with his family. "All questions and concerns were answered very quickly and without making me feel stupid or that I was bothering him for asking"
"There were marks left on our ceiling, and I was told that someone would follow-up in a day or two to clean it. No one ever..."
Our office is very involved in our community, and we regularly contribute to charities and events. Some of the organizations we support include Habitat for Humanity and United Way; we also participated in an episode of Extreme Makeover: Home Edition! Find out more on our Community Involvement page. Bone Dry Roofing maintains a number of certifications that help us do the best job we can on every home. We are Owens Corning Top of the House Certified, and we are also certified through GAF and CertainTeed. We hold an A+ rating with the BBB and we are a member of Angie's List, where we have won several Super Service Awards. All of these organizations contribute to our success, and we are very thankful for their support! In 1989, soon after he graduated from college, Gene started Bone Dry with just a truck and a garage office to its name.